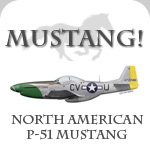 Includes an applet in which you can type a Mustang serial number to find its exact type. List of all American Mustang aces, with units and aerial victories (total victories/P-51 victories). Addendum to the French Mustangs article, list all Armée de l'Air Mustangs with serials, units, names and fate . Addendum to the upcoming "RNZAF Mustangs" article, list all RNZAF Mustangs with serials, units, names and fate .